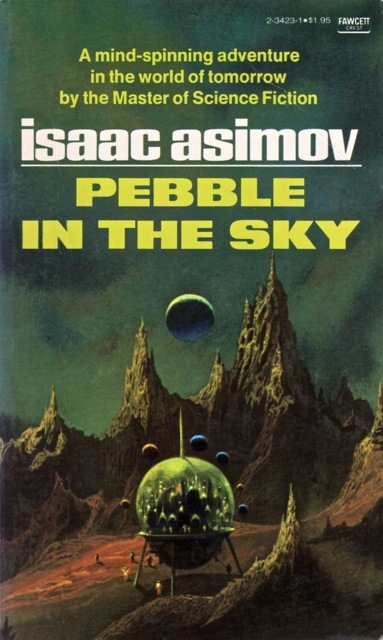 Pebble in the Sky (1950), Isaac Asimov’s first published novel, is a revision of the earlier short story ‘Grow Old With Me’ published in the late 1940s. 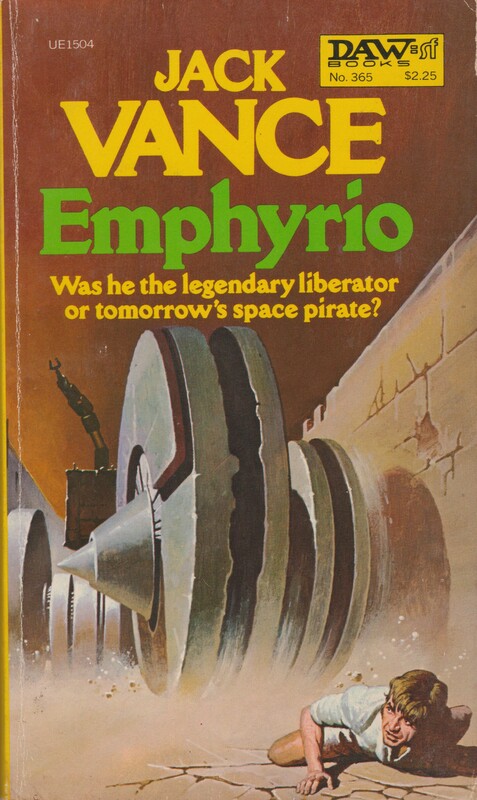 The novel itself takes place in the vast Galactic Empire based at Trantor that features in so many of Asimov’s short stories and novels — most famously, Foundation. 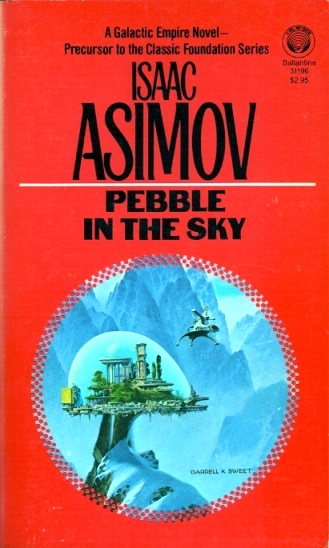 Although I am generally unimpressed with Asimov’s science fiction, Pebble in the Sky contains intriguing world building and an elderly man as the main character which is rather rare in sci-fi (albeit, this does not prevent a silly romance between the other younger main characters from providing the novel’s emotional core). But, most appealing to me, Asimov moves away from the all too simplistic dichotomy of good vs. bad that characterized most pulp of the day. 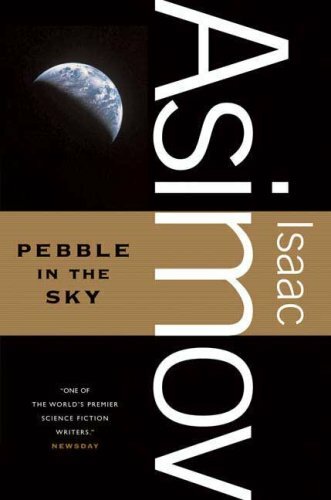 Joseph Schwartz, a retired tailor, is accidentally transported thousands of years into the future due to a nuclear laboratory accident (be warned, Asimov had not fully settled on his Future History outline so readers who know Foundation inside and out will find some dating inconsistencies in Pebble in the Sky etc). Future Earth has been drastically transformed… The planet is a minor province in a vast Galactic Empire, its soils and air is radioactive, and its people are governed by strange (an outside might argue, disturbing) customs. Earth is ruled by a Procurator who lives with his court high in the Himalayas. Local authority is in the hands of a group of fanatics who believe that Earth should be independent from the Empire. Due to the barren state of the planet the population is held low and all individuals over the age of sixty (and those who no longer can work) are euthanized. Due to the fact that the language has changed drastically, the people who find Joseph think that he is mentally handicapped. He is taken to a controversial doctor in Chica (what was once Chicago) who has developed a machine to increase intelligence (queue standard plot device). Joseph is “volunteered” without his knowledge for the procedure… Over the course of the rest of the novel Joseph learns the true extent of his new abilities. The second plot strand follows Bel Arvardan, an Archaeologist at the University of Arcturus. Bel Arvardan is a proponent of a controversial theory that all of humanity originated on Earth. However, due to the intense hatred Earth holds for Outsiders and the Galactic Empire’s hatred of Earth — Asimov makes it clear that this is a vicious self-perpetrating loop and neither party is more complicit than the other — Arvardan’s theory is met with derision. Both plot strands — Joseph Schwartz + Dr. Shekt’s scientists who operate on him and Bel Arvardan’s archaeological mission — combine in a rather contrived way. Arvardan falls head over heels for Pola, Dr. Shekt’s daughter, despite his initial prejudice: “The women weren’t bad-looking… His brows knit. Of course even tolerance must draw the line somewhere. Intermarriage, for instance, was quite unthinkable” (123). Eventually the parties uncover an Earth plot to send missiles with a virus to the planets in the Galaxy — but who will listen to them? Can they even agree with each other what should be done? Read as a commentary on colonialism Pebble in the Sky is at its most thought provoking. The Galactic Empire reads as a sort of European power who have colonized other planets. For example, Bel Arvardan’s opinion of Earth people is complex due to the poor status of Earth — he believes that he is more enlightened, yet, simultaneously admits that his prejudices are from birth. Try as hard as he can to dispense with childhood indoctrination it creeps into his dialogue, his thoughts, and his actions. 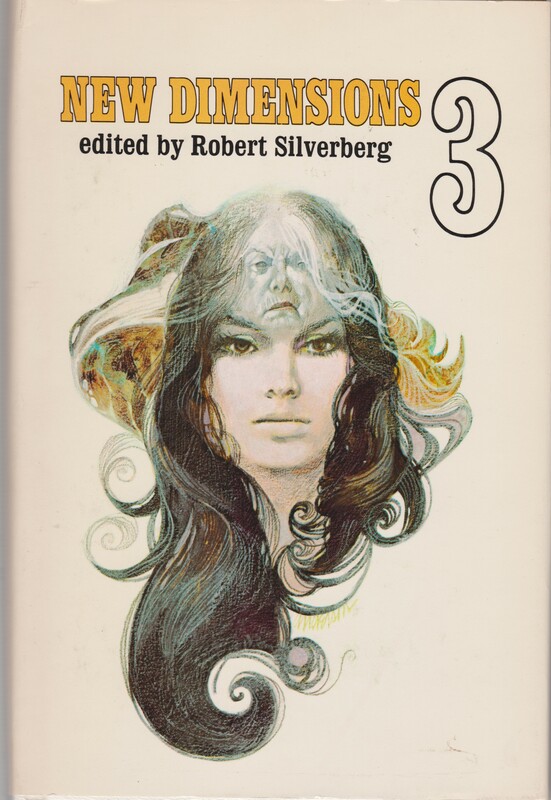 It’s rather a shame that Asimov thought that the only way for Bel Arvardan’s views to be fully altered happens after he fell in love with an Earth woman…. Earth’s inhabitants (and fanatical organizations that govern them) view the Galactic empire with hostility as well. Earthmen are unable to leave the planet for healthier worlds yet are simultaneously condemned by the outside world for their “barbarous” actions despite the environmental situation on their radioactive planet. Both sides have a full range of superstitions they hold for each other. Asimov’s world building and characterization is top-notch. 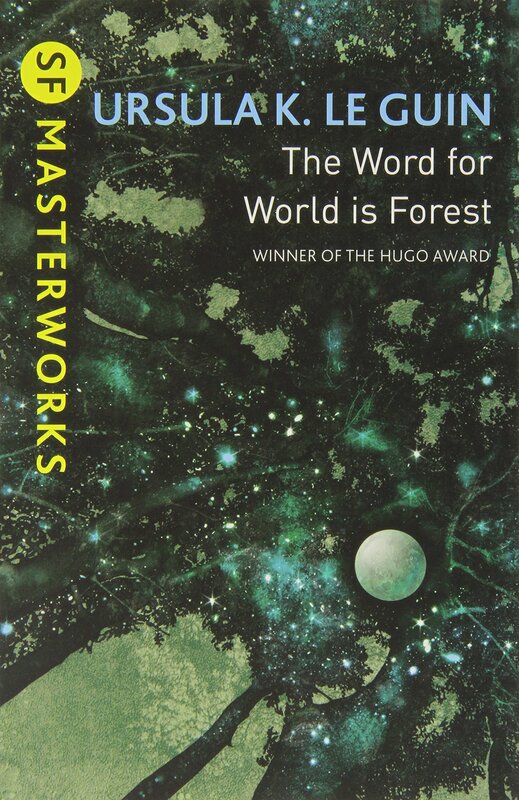 However, I found that the plot integrated rather haphazardly into the word — and plot-facilitating last minute insertion of missiles filled with biological weapons is simply to bring a little tension and a quick conclusion. 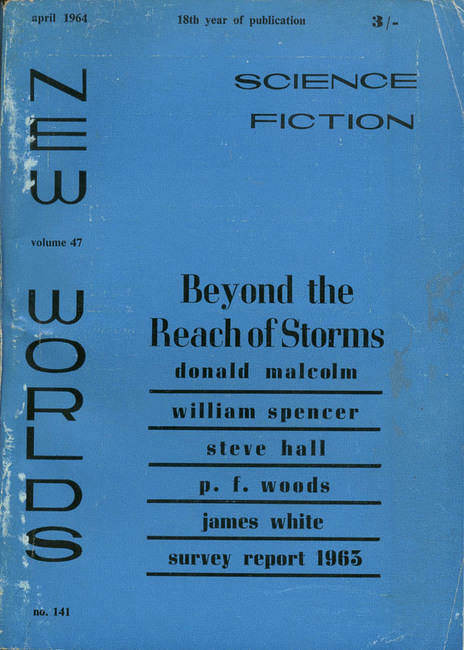 I had that 1964 edition at one point; I spent a while looking for it but it looks as though it was sold during a move. I remember the back cover blurb making things a lot more apocalyptic than your description, though. Yeah, there is radiation on Earth but it doesn’t really effect people that much… So no, a relatively “weak” apocalyptical feel — although the book might qualify as such. Do you think the first (1957 edition and modified 1964 edition) cover is Powers? It very well could be Powers; if not, at least someone influenced by his style. What do you think of Volkmer’s cover for the 1960 German edition? I sort of enjoy it…. his other work isn’t as good in my opinion…. The colors really make that Volkmer cover. I think it’s sort of dynamic and fun…. But yes, the colors make the cover. I thought it was a post-apocalyptic piece too, which is why I picked it up – that’s probably why I was disappointed. It also didn’t seem as good as the I, Robot stories. But with hindsight, the book now seems above average. 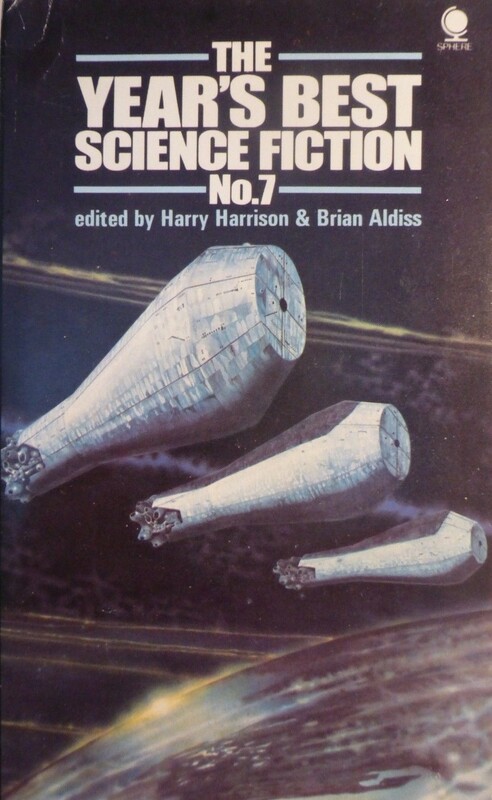 I’d picked it up during one of my post-apocalyptic binges, but never got around to reading it… I really should read more Asimov so I can make an informed decision about his writing. 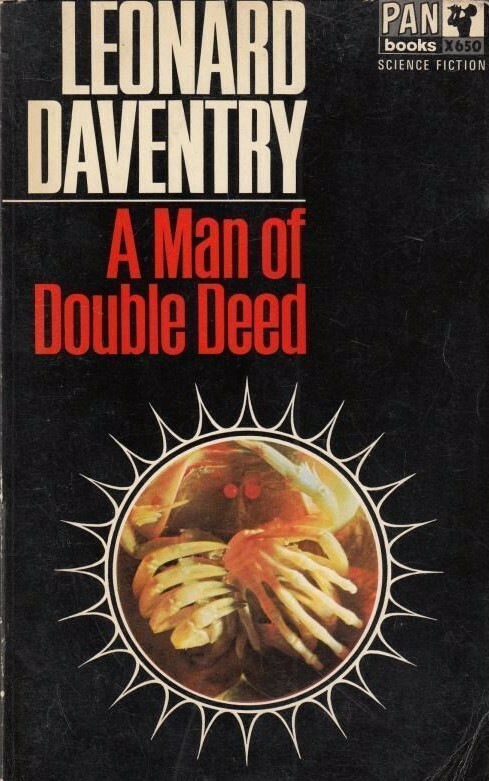 The few stories of his I’ve read have been pretty good, though my general opinion of his work has been negative, for no well established reason. The use of color really makes the Volkmer cover; without that it’d be too simplistic. 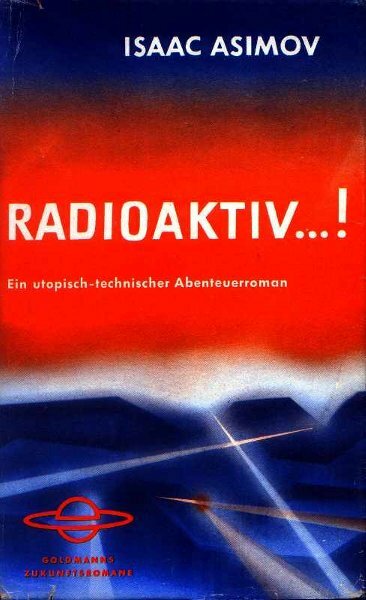 (From what I can remember of German, it’s pitching it as a “technical-utopia adventurenovel,” which I found kinda funny.) The neon red and “RADIOAKTIV!” grabs my attention. Speaking of post-apocalyptical binges…. I have a copy of Peter Greenaway’s difficult to find The Crucified City (1962)…. The joys of effective Inter Library Loan at a University Library I guess. But, supposedly not such a horrid read. Yeah, I must have accidentally skipped over that Powers cover while looking at the listing because I certainly remember it. Ohh, jealous — there’s a few on eBay right now, for the low low price of $120 or more. (Granted there’s a few on there for $10 or so, but still, it’s pretty hard to come across…I think it was a UK-only release.) I’ve heard a little about it, supposed to be a bit grim but solid… awaiting your review. Both came from other university libraries…. Not sure what I’d do without them. Can only afford cheap paperbacks as a grad student — haha! My Powers biography does not list the ’57 edition as being one of his. it does look like his work though. The artwork for the crater doesn’t match his usual style, though he was doing more of a “realistic” style around that time than he would use in later years. The thing which most impressed me while reading the Empire novels recently was how preoccupied they were with race relations. Asimov is generally not thought of as a writer of social issues, at least not about issues more socially pressing than “there must be environmental balance” or “all humanity has to be considered rather than a special set favored”. I grant he gives the subject of racism and social equality kind of a polite, clean treatment — The Currents Of Space shows all sorts of levels in a deeply stratified, deeply sumptuary society in which every character hates his station in life but can’t imagine how to change it — but considering how much of his work was based on logic puzzles and interesting thought-experiments the effort to be about something substantial and relevant to the contemporary reader stands out. And he does really well in highlighting the little ironies of life, like the way Arvardan feels shunned on that transport after his offworlder status is noticed and how dare they treat him like that. 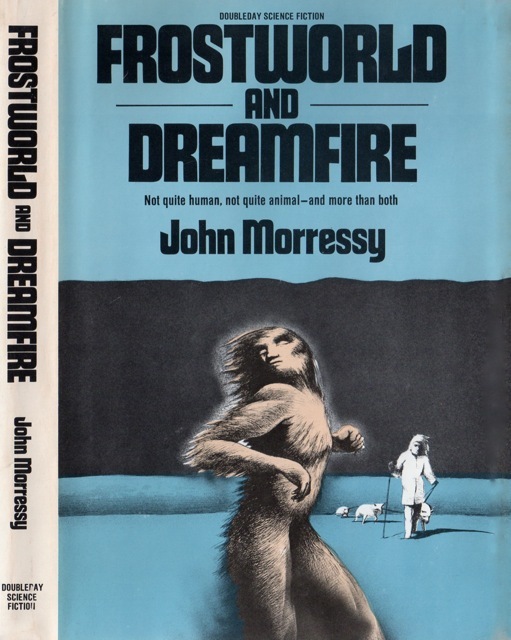 There’s a half-hour adaptation of this on the old-time radio series Dimension X (unless it’s the similar show X Minus One ; both are easily available through archive.org), but that cuts out the entire — and, really, implausible — Joe Schwarz storyline, with tragic consequences for the faithfulness of the adaptation and, well, other parties. 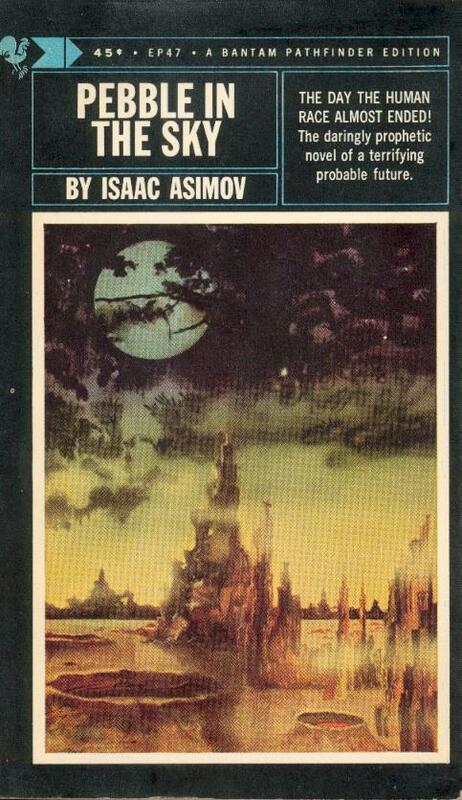 Asimov published “Grow Old With Me” in the book The Alternate Asimovs, which also has the first draft of The End Of Eternity and the original ending to “Faith”. Each is interesting, although “Grow Old With Me” has the fewest important variations. The biggest is the story starts out with the separation of Arvardan’s and Schwarz’s stories as explained by some of the most agonizing narrative prose ever put to paper. 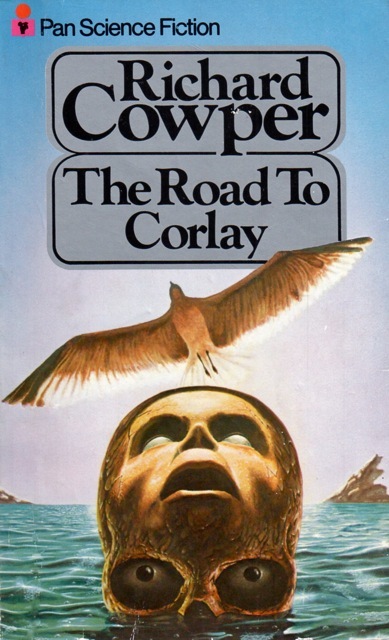 But yes, by far the most intriguing aspect of the novel was the discussion of race and colonialism. 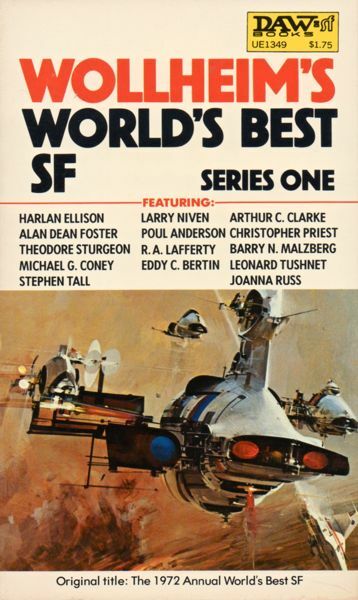 You’re right, Asimov is rather underrated as a social sci-fi author. The squeaky clean treatment is probably rooted to the era in which is was written — and his social commentary really never changed from this type of treatment even during the 60s. But, regardless, the fact that he’s writing this in the late 40s early 50s still strikes me as surprising. 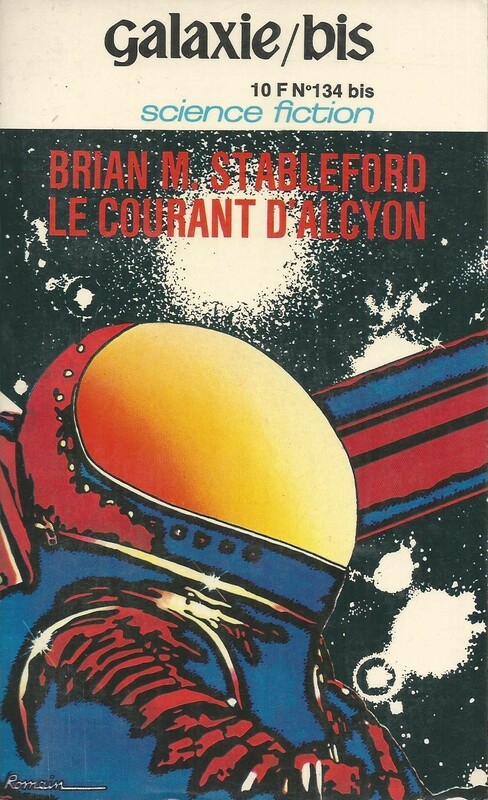 I’ve read Currents of Space twice but quite a while ago — perhaps the first classic sci-fi novel I ever read. Look at that crappy cover on the 2008 version! 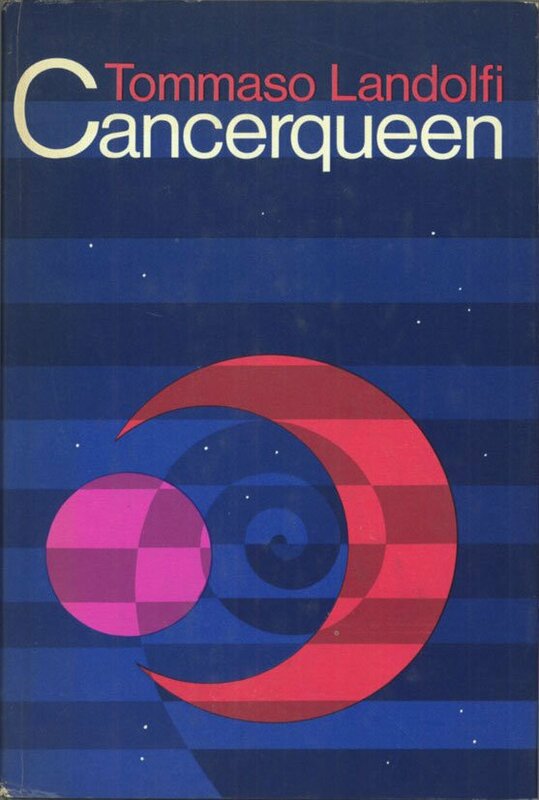 Whatever happened to thoughtful and interesting book cover design? Asimov comments that he was at least for some time with the Futurians. This was a group of SF authors and fans who were associated with/ fellow travellers of the CPUSA or in a few cases the Trotskyists. Foundation clearly bears its imprint, with the sequence being a mode of production shift — End of Empire — role of Church — Feudalism — Merchant Capitalism — Industrial Capitalism. And the Second Foundation is a heavily sanitized view of the Stalinist concept of vanguard and its Political Bureau. So it is not surprising that the Good Doctor took care to hide all this under many layers. But you have serious anti-colonialism. You have critical views about Malthusianism in some of the novels. And as Asimov was a Jew, but not a Zionist, the Zelots versus Rome image also seems to creep in with imperialism and racism condemned, without a necessary endorsement of the extremists among the oppressed. Thanks for the comment. Do you notice these types of views in Pebble in the Sky? (it’s a pretty bland book ultimately regardless of the intellectual/ideological/political environment of the day).